eGPU – what a thing! I’m a proud owner of a ThinkPad X1 with Ubuntu 18.04. It’s a beautiful system with a very nice operating system. However, when I got it, I didn’t opt for 16GB of RAM. I was aware of this potentially being a problem, since I have to manage three different Google Chrome sessions at the same time, but I thought I will be able to manage it. I’ve failed. It’s impossible to do real work with just 8GB of RAM. NVMe for swap does help, but as always swapping on desktop is a road to frustration. I’ve decided to look for another laptop. One think to note is that I love Unity. Today, I still think it’s the best desktop UI for me. It’s flexible enough, keyboard orientated, doesn’t waste screen space. All the good stuff. However, it seems that majority doesn’t share my view and Gnome 3 has become default desktop in 18.04. I have to admit – I do not like it. It requires too many mouse clicks and it’s too rigid. This all led me to a decision to give a try with a system I haven’t touched since 2005. The MacOS. Mac and I have been seeing each other since System 6, but we broke up when Apple decided to go to mass market with Intel CPUs. G4 was the last Mac I owned. The breakup was so bad that the infamous G4 ended up running Debian. But, I digress. Considering all this, I decided to give Mac another chance and I got myself a Macbook Pro 13″, the 2017. edition. Re-learning OSX was not fun and after a lot of brewing and buying to mimic Unity as much as possible (I even got Ubuntu fonts and changed terminal colours to match Ubuntu’s), I got to a stage where I can use this machine with minimal obstruction. There are some really nice things on Mac, particularly if you also have an iPhone. It’s not flawless and anyone who claims that had too much cool aid. I would go that far and say that Unity is, or sadly was, much better interface. One of the things that doesn’t come with Macbook is a decent GPU. It’s also a bit frustrating to move files around between my desktop and laptop. But here’s the thing… All these new laptops, including the X1, have Thunderbolt 3 ports. These ports are capable of 40Gbps. And that allows us some really neat things. Things such are eGPU. I’ve decided to give eGPU a try. I got Akitio Node Pro and a Sapphire Radeon Vega 56 GPU. Assembling all this is a piece of cake. I was afraid that the power provided by the Akitio might not be enough for the GPU, but so far this has not been a problem. I’ve combined the setup with three Dell U2415 and Griffin Elevator. A downside is that Akitio comes with really, really(!!) short Thunderbolt 3 cable, so I couldn’t place it under table. What’s even worse, none of the Apple stores (or stores in general) have a 2m Thunderbolt 3 cable easily available. So, for time being, Node Pro will sit on the table. Of course, there are my old dasKeyboard and Razer mouse. Keyboard is excellent, but the mouse is showing its age. Sure, tons of cables. 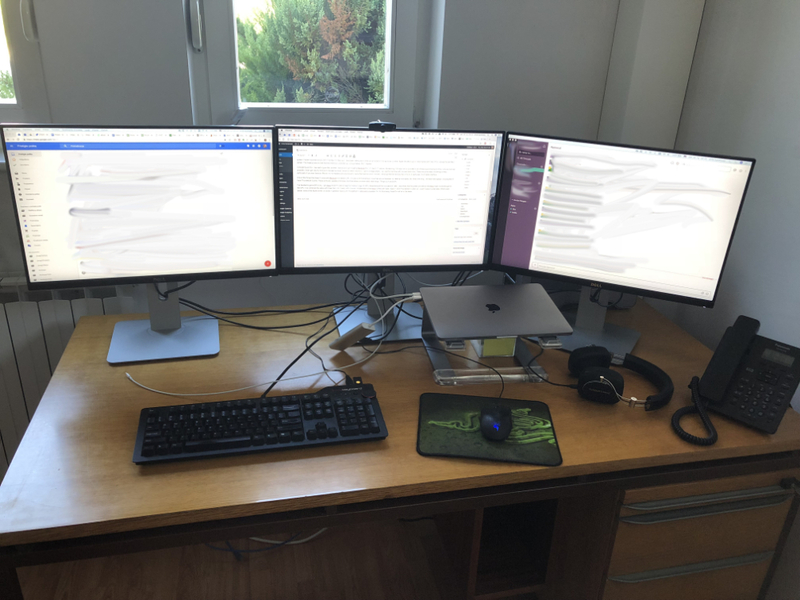 Needless to say – on Mac everything worked out of the box (on both High Sierra and Mojave). Now I have all my files always with me and my desktop adjusts to my environment. I can share resources within the company; if someone else needs GPU power, they can just bring their laptop to the station and plug it in. Is eGPU future? No, it’s not. It’s already here and working perfectly. But it will be interesting to see what other capabilities Thunderbolt 3, and faster, ports can bring. Next to do: connect my Thinkpad with Ubuntu. I have no doubts it will be a learning experience.